It’s the first new composition from Peter to be released since the track Show Yourself featured in the film Back to Front – Live in London in 2013. What do you think of the new song? Leave a comment and let us know. It’s so disappointing to see so many disrespectful comments. Peter Gabriel is a great artist and as an artist he has chosen to pay tribute to Muhammad Ali with a song that was inspired by him. He makes clear that it’s not new, he’s not trying to sell tour tickets nor is he trying to sell anything at all. This is a great artist paying tribute to a great man. You can take it or leave it. I’m a taker for all things Gabriel and he has delivered so much over the years that he’ll always have the benefit of the doubt with me. Are you the same Merck affiliated with Elton John? I’m not sure I see all that many disrespectful comments. I see some folks, myself included, who are disappointed with a portion of Peter’s later-career output; or perhaps better stated as a lack thereof. He seems to be treading water. None of that takes away from the masterful career accomplishments for the first 30 years. But it’s definitely a bit of a disappointment to see his output stagnate. I don’t think commenting on that is disrespectful at all. I take that kind of view on another one of my all time heroes, Stevie Wonder. He’s put out one album since 1995. 21 years….. He’s one of my all time heroes, but it’s a major disappointment to not hear new music. Yes I am. I take your point about Peter and Stevie and wouldn’t argue it. My point is that Peter’s gesture to Ali – which is the only reason we are hearing this song – has been missed by almost every commentator. Basically the track would not be out of place on UP and convinced it originated from that time…….his next album is supposed to be almost done (in PG timescale that is!! )…..so if lucky we may get I/O (the title he has referred to for many years now) some time in 2017…..her’s hoping. As ever with PG, you get something real, alive and moving……not cheap plastic music as most ‘modern’ artists spew out……somebody needs to inform some modern artists drum sounds are better from a live drum kit and not a computer!! for those who think it’s his first (completed) ‘new’ thing in 14 years. It isn’t. He released ‘Down to Earth’ in 2008 on the Wall-E soundtrack, ‘Cape Cod Kwassa Kwassa’ (a cover but stil great…) with Hot Chip in 2008, ‘Different Stories, Different Lives’ in 2007 (in the ‘Sea Monsters Movie Endtitles) and the Big Blue Ball Project in 2008 (which was old material finished then, but recordings dates back to 1992). The man is slow and picky but he releases from time to time. Love this new release by the way. Great song, sounds like and UP outtake and that was a very good album with excellent work like ‘Growing Up’, ‘No Way Out’, Signal To Noise’ etc. Before Ovo, Peter Gabriel was perhaps the only artist for me that had never put a foot wrong. Maybe not scaled the heights of Bowie or had the impact of the Pistols, but he’d always made great music. Ovo was hit and miss, Up was more miss than hit and I think I only made it through once. I thought the covers album was dross. For me, this track does nothing to correct the course and I’m worried that he’s pretty much lost the ability to pen a good tune. Come on Peter…PLEASE give us the album! You just know he’s got so much material like this hanging around…and it’s quite good, of course! I think Melt and Security are two of a very, very short list of records for me by any artist that don’t have a single flawed note. They are complete master works from top to bottom. Why does no one consider security a true milestone? For me it is timeless and embodies everything PG stands for. Beauty is always in the eye of the beholder but San Jacinto alone, man, the live version from Us Tour is so good. Agreed that Kiss That Frog should have never be more than a b-Side. Never digged OVO either. Peace. Watching POV later. While I don’t think this new song is earth shattering, I’m focused more on some of your comments. “Us is a little spotty at the finish. Kiss that frog is particularly atrocious”? “Up is also good, but is way too long, and way too depressing”? Wow, I think US & UP are as masterfully as anything prior, if not more so. I can’t imagine anyone who declares themselves a fan thinking these albums are anything less than great. I never understand how any fellow music fan of a particular artist isn’t able to comprehend, not all songs are going to resonate the same with all listeners. I would venture to say there are far fewer of us rabid Peter fans who dove deep into the catalog to actually know all the core tracks to Us, OVO and UP vs. the general public. I think that in and of itself shows are status as true “fans”. It’s not a requirement that we drool over all the material he creates. We could go album by album and cherry pick the brilliant numbers vs. the less inspired pieces. Overall Us is a great album. Ironically for me, two of my all time favorite tracks are the ones I don’t think he ever played live. Only Us and I Love to Be Loved. Master class pieces of work. And I think Johnny Feathers nailed Up perfectly. There are some wonderfully haunting songs on there. But as a complete album, it is in dire need of editing. Too many tracks take too long to say what could be said in two or three less minutes per song. (Not to mention songs like Barry Williams should have been left on the cutting room floor). Of note, this new track is cut from the same cloth. Another 7+ minute track that really didn’t need to be that long. But clearly this is Peter’s comfort zone in this period of his artistry. This is just my mileage and doesn’t change the fact that PG is one of my all time musical heroes. Agree 100% with Johnny feathers first post. Except I do think Us is a little spotty at the finish. Kiss that frog is particularly atrocious. But from a cohesive album standpoint, it is much more complete than So. It is rather frustrating that Peter is such a perfectionist. He could have put out three or four albums worth of material in the time he’s been tinkering with the back catalog. Yeah, Kiss That Frog is maybe the weakest track on there, being either silly or kind of gross in its imagery. Though it’s one of the few lighter moments on Us, so I tend to be forgiving with it. So one new song after 14 years, tentative release date for the new album is 2156. Can’t wait to pre-order! Are you sure, my friends, that it comes from the Up era? To me, it sounds far older. Anyway, I like it very much. I certainly don’t have any proof, but the programmed drums and synths, as well as the tone of his voice, sound very similar to the material on Up, to me. I’m thinking of More Than This, My Head Sounds Like That, etc. I don’t think he used those loops until the late 90’s at the earliest. Well, I have listened to him since the debut, and I think Us (and the Secret World tour) is his first peak after a fantastic series of better and better albums. After that, he didn’t become interesting to me again until he revisited his old work in Scratch My Back and the New Blood live tour. I reluctantly went to the So show, and it was much better than I expected. I love it. And I’m deliriously happy to have new original material from Mr. Gabriel, even if it is only one song. even as a completist of PG’s material and knowing a little bit about the song’s history, i still have to remark that the only good thing to ever come out of boxing would be my choice of unmentionables. Totally unrelated to this post but Paul can you help me as i have been posting comments on the Blank & Jones / so80s box set thread and they are not showing up is there a reason for this or is it a bug ? Just had a look back… found one not approved (sorry, just got missed) but not finding any others…? I posted the same message about 3 or 4 times and they are not appearing at all when normally it always comes up this post is awaiting moderation very strange. Sounds like a leftover from Up. Sounds great! Somewhere between So and Up in its timeline I think. Well, this is a pleasant surprise. I was expecting another outtake/demo from something earlier, like Courage. This definitely sounds like Up material. It’s not entirely a compliment. Up has turned into a bit of a slog to get through–it needs an editor, badly, and maybe less programming, and something NOT grimly depressing in there–but it’s nice to hear something “current”, whatever “current” might mean in this case. (Something from the past 14 years can be called current?) Being a PG completist, I’ll have to purchase. As I’m listening for the first time, I’m digging it. How obstinate is he being about releasing a new album at this point, anyway? This sounds done. How long has it been done? Are there another 6-7 or so songs also done? (At 7 or so minutes a pop, he certainly doesn’t need 10 of them for an album.) Can they not be released as an album? No melody, no hook…just words that drone on and on. There isn’t one line you can remember or sing to once it ends. Like many hope to hear a new album from PG someday,otherwise this will do.The man is still a genius. The metamorphosis into Brian Pern is complete. Too funny! Even as a BBC Four challenged viewer here in the States…I still got/get it. It has to be said the Brian Pern episodes are absolutely brilliant if anyone has never seen any of it do what you can to dig it out. Although it is supposed to be about PG and “Genesis” the real star is Michael Kitchen as their manager. The cameos they get real stars to play are usually epic. PG even pops up in two episodes. LOL, sounds very generic in relation to his own previous material. Anyways sounds 90 percent better music than anything in the market in comparable genre. The voice is still there too. Amazing is that PG has been able to avoid anything original before this for 14 years now, just recycling the magnificent back catalogue. Such a shame considering his talent and potential, which is unique. Well, I like Us but not Up – this song sounds like an outtake from Up, for which he says he started around 100 different musical ideas/songs before starting to cut down and focus in on the things he wanted to develop to full songs. I suppose I’m not the demographic you’re looking for, as I got into him with his greatest hits and Us, then picked up the rest of his catalog. That said, I do think Melt and Passion are contenders for his best work. Us is great, and I don’t think that’s just nostalgia talking. It sounds like a more fully-realized album than So–yes, So has the big hits, but Us to me is a full, complete work, where all of the songs relate to the subject of relationships. It might drift into MOR stuff, but Digging in the Dirt and Come Talk To me are undeniably great. Ovo is good, but also isn’t quite a full Peter Gabriel album. The highpoints are great, though–Downside Up, Father/Son, and Make Tomorrow. Up is also good, but is way too long, and way too depressing. There are some great moments, but the cumulative effect is pretty grueling. It’s just kind of exhausting, both time-wise and emotionally. I’ve actually given up hope that we might see a new album of original material from PG as his touring and latest albums indicate a great artist who has decided to tour around his classic material and also who seemed to run out of ideas along the way. I hope to be proven wrong. I liked the previous tour with So in its entirety, along with the classic band and staging/props, but his upcoming tour with Sting is literally the first time I’m skipping a show of his since becoming a fan with Us. It just seems a waste of time to hear the same songs over again (or him covering Sting). If he would tour behind a new album, I’d be there in a heartbeat. You are in the minority. The new albums by classic rock artists don’t sell, so now touring is where the money is at. And if an artist does tour to support a new album, as soon as they say “here’s a song from my latest album,” no one cares. The audience wants to hear the hits, not deep cuts, not new music. So most acts will only play a few from new albums, or better yet, just tour. It’s maddening. I pay money for a concert to see and hear a good show, not so I can hear “Solsbury Hill” for the 20th time. If I wanted a particular set list , I’ll put on a live CD and save myself the time and money. True. And new material doesn’t necessarily mean it’s going to be good. (I found Up harder to get into, live, than Us.) But I’m with you regarding certain hits. I figure the Back to Front Tour was really the last time I need to hear some of the more often-played So tracks. Didn’t think much to it. Sounded like a spruced up demo. Probably don’t care if I ever hear it again. Still hopeful for an album at some point. While I’m always happy to have new music from PG, I have to laugh at the quote. “I wrote a song a few years back…” Does he just have songs and albums finished and ready to go and sort of forgets about them? I will comment on the NEW song unlike some of these other people who are not even referring to the song “I’M AMAZING “. Wow ! A great track. Classic Peter Gabriel ! If it’s a tribute to Muhammad Ali that is sweet. Ali touched many peoples lives. 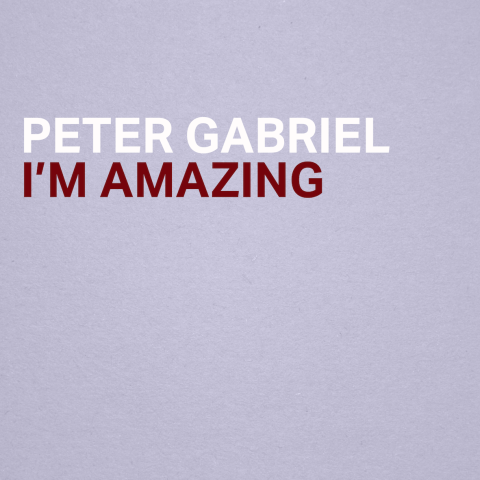 Anyway, if I can listen to a song once and like it fantastic , I predict “I’M AMAZING ” will chart pretty well for Mr Gabriel. This should appeal to most Peter Gabriel fans except for your former negative reviewers who were mostly talking about old Peter Gabriel music anyway.